Cam Jennings coached AVRA athletes from 2012 - 2015. He was selected as Cycling Canada’s Head Coach to the 2015 Junior World Track Cycling Championships, and then hired as the first Canadian Women’s Track Endurance NextGen Coach. Cam successfully developed and coached the NextGen program. He returned home to Australia with his family (wife Cally and 2 new little Canadians, Ruby and Ralph) in 2017. He now coaches the Australian National Para Cycling Team. Kinley Gibson started with AVRA in 2012. She became a junior national champion on the road and track, a silver medalist at the 2013 Junior World Track Cycling Championships, and was 9th in the ITT at the 2013 Junior World Road Championships. In 2014 Kinley joined Trek Red Truck, and in 2015 also rode for Cycling Canada’s NextGen Track Endurance Team. Kinley currently represents Canada on the Canadian National Track Endurance Team and rides for The Cyclery road team. Evan Burtnik began with AVRA in 2014. He became a junior national champion on the track, and junior national medalist on the road. 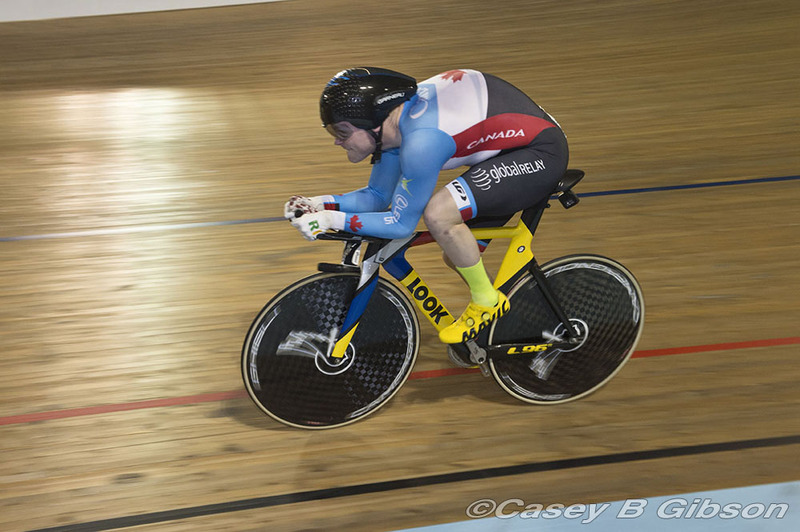 Evan competed at the 2014 Junior World Track Cycling Championships and was a bronze medal finalist in 2015. In 2016 Evan was selected to Cycling Canada’s NextGen Track Endurance Team as well as Team RaceClean road team. Evan currently represents Canada on the Canadian NextGen Track Endurance Team and P2M. Anna Talman began with AVRA in 2014. As a junior she competed nationally on the track and road. She was one of 3 AVRA athletes selected for the 2015 World Junior Track Cycling Championships. Anna has been riding for Trek Red Truck since 2016. Stefan Ritter started with AVRA in 2015. Stefan was a junior national champion on the track and competed nationally in other disciplines. He competed at the 2015 Junior World Track Cycling Championships. In 2016, he became the Junior World Champion (Canada’s first ever) in the 1 km Time Trial (Kilo). Later in 2016 Stefan also set junior world records in the Kilo and Flying 200m. Stefan has been a Cycling Canada National Track Sprint Team member since 2017. Ross Wilson started with AVRA in 2014. He competes in the C1 category for Para athletes on both the road and track. In 2014 Ross raced nationally and began racing internationally at World Cups. This led to his selection to race at the 2014 Para World Track Cycling Championships. Ross was a silver medalist at both the 2015 and 2016 Para World Track Cycling Championships. At the 2016 Paralympic Games Ross took silver in both the IP on the track and ITT on the road. Ross is a member of the Canadian National Para Cycling Team and continues to compete internationally for Canada on the road and track. Devaney Collier began with AVRA in 2015. As a junior she competed nationally on both the road and track. In 2016 Devaney was a silver medalist at the Junior Track Cycling World Championships and also competed at the Junior Road World Championships. In 2017 she was selected to Cycling Canada’s NextGen Track Endurance Team, and in 2018 began riding for The Cyclery road team.